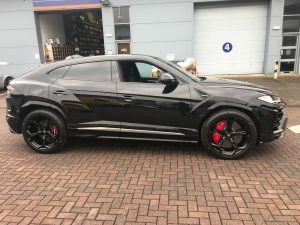 Northern Supercar Hire is pleased to welcome the Lamborghini Urus, the new Super SUV to its fleet. Priced at nearly £160,000 this is an SUV that has to be driven to be believed. As you would expect from one of the world’s most famous supercar producers, the Urus is one of the world’s fastest SUVs. The Super SUV features a 4 litre twin turbo V8 engine, producing 614 bhp with an 8 speed gear box. And all of this power comes in a beautiful, high-tech Super SUV package. If you’d like to drive the amazing Lamborghini Urus, call Northern Supercar Hire now for more information and a free, no obligation quote.